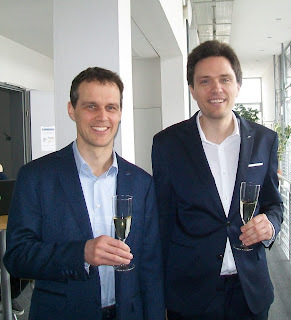 Willi Mann successfully defended his PhD Thesis “Efficient Techniques for Set Similarity Join Queries”. While being a student at the Department of Computer Science Willi was associated with the Doctoral College “GIScience” at Z_GIS. The DK GIScience has profited from this in-depth research in database science. In particular the focus is to efficiently store and query very large volumes of data. The combination of database research and Geoinformatics will provide a deeper understanding of fundamental problems in bridging the gap between database systems and GIS software. In his Thesis, Willi focused on techniques for set similarity join queries. The join is a fundamental operation in databases. A growing number of problems require joins with fuzzy predicates. A class of frequently applied fuzzy predicates is the similarity of two sets. Typical set similarity functions include Jaccard, Cosine, dice, and Overlap, and the Hamming distance. The set similarity join can be executed in offline settings where the input is known up front and online settings, like on streams of timestamped sets. Willi’s work resulted in three high level publications which correspond to the three chapters of his thesis: Willi proposed a new filter, PEL, for offline set similarity join algorithms. Then he extensively compared offline set similarity algorithms and finally he proposed a new algorithm, SWOOP, for set similarity joins on streamed data sources. We wish Willi all the best for his future career and endeavours! This brochure introduces our new research projects, documents progress in study programs and outputs from our conferences in 2017. Enjoy reading - and we're glad to hear your comments and inputs! This issue was addressed by the 4th International Conference on the Use of Space Technology for Water Management, which recently took place in Islamabad, Pakistan. More than 100 experts from all over the world discussed cutting-edge tools and findings to better understand, describe and quantify water-related issues using space technology. The conference was organised by the the United Nations Office for Outer Space Affairs, the National Space Agency of Pakistan SUPARCO on behalf of the Government of Pakistan, and the Prince Sultan Bin Abdulaziz International Prize for Water. The range of applications covered the entire water cycle - extending from precipitation estimation from satellite data to glacier mapping, run-off estimation, erosion and water quality assessment, evapotranspiration calculation and beyond. In his keynote presentation within the session on case-studies, Lorenz Wendt (Z_GIS) gave insight into the lessons learned by Z_GIS from developing water-related information products and services and providing those to humanitarian actors within the EO4HumEn+ project. The key to success in many water-related applications of space technology is the integration of remote sensing data with information collected in situ, by experts or measurement systems on the ground, which is both a technical and an organisational challenge. No the less, space technology bears a great potential to tackle the many water-related challenges the world is facing.